Do Real Estate Signs Make a Difference in Front of Your Home? Is it really that important to have a sign in the yard when you consider today’s Internet market? Probably not. However, I’d venture to guess that it will serve as a very good reflection of the type of property management company you may want to work with. For example, at RentWerx San Antonio our signs are very good and we’re proud to show these signs off. We use hard metal signs with sturdy metal frames. The signs include our website and they also have a QR code. This tells people we have pride in our work and we’re willing to produce a high quality sign to put in your yard. Other companies I’ve seen have smaller For Rent signs or signs that resemble those For Sale by Owner signs. They are considerably lighter and pretty tiny. They’re also made of plastic and they have a stick instead of a frame. These signs might cost $4 or $5 to make. We pay around $35 per sign, and we’re willing to make that investment because we think they look good and serve an excellent purpose. When we put them in front of your property, we know they reflect on your house and on us as a company. It gives a great first impression to someone who may consider renting your home. It’s very important to highlight the website. By listing the site on the sign, prospective tenants can reference it right away. They can even access our site and take a look at your home listing right then and there, while they’re standing in front of the property or driving by it. They can get more information about how the inside looks and review details before making an appointment to see it. At RentWerx San Antonio, our signs are a step above the rest. We think it’s important to represent ourselves and your property well. 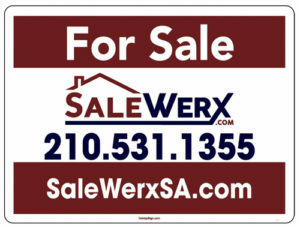 We would love to put one of our signs in your rental property’s yard, so contact us about our services. We look forward to talking with you.